In 2008 UNESCO listed Georgetown as World Heritage Site because of the many original colonial (Chinese style) shophouses. Besides the many beautiful historical buildings; Georgetown also has many modern highrise buildings that often contains big shopping malls. In and around Georgetown there are many fun attractions that are absolutely worthy of a visit. Kuching is the biggest Malaysian city on Borneo and also the capital city of the state of Sarawak. Kuching is a very popular tourist destination as it serves as entry point to numerous great attractions within the heart of Sarawak. The city has enough to offer to keep tourists occupied for at least a couple of days. Popular attractions around Kuching are among others Semenggoh Rehabilitation Centre and Bako National Park. There are daily flights to Kuching from Kuala Lumpur and Johor Bharu. Kota Bharu is the capital of the northern state of Kelantan. The city serves as main gateway to visitors that are on their way to visit the tropical island of Perhentian. The are daily flights from Kuala Lumpur to Kota Bharu, but you can also opt to take the bus or even the adventurous jungle train. Main attractions in the city are the many islamic museums, and also the day and night markets. Though tourist usually pass through the conservative city; there is enough available accommodation in Kota Bharu. Pulau Redang is a small island group in the South Chinese Sea, on the east side of Peninsular Malaysia. Redang lies within protected marine waters, also known as Terengganu Marine Park. It lies about 45 kilometers from the coast of the city of Kuala Terengganu. Next to the main island Redang are many other smaller surrounding islands. The island is surrounded by crystal clear water and has various beautiful diving possibilities for the aficionados. You can also snorkel around the island; the coral reefs are in good health. Redang usually is not too crowded, though during local school holidays and public holidays it can get very busy on the island. Because Redang is part of a Marine Park, all visitors have to pay a marine park entrance fee of RM5 upon arrival. "Pulau Redang (Redang Island) has grown into one of the most popular tourist destinations on the east coast of Peninsular Malaysia. The reefs of the Redang archipelago are home to over 55 genera of corals and 100 species of fish." The island is especially popular among travelers who like a bit more luxury during their stay. Redang has many luxurious resorts, many of them are of international standards. Restaurants often are part of the resort; there are only a few privately owned restaurants on the island. Most of the food & beverage outlets can be found at Pasir Panjang; the most popular beach of the island. Resort restaurants usually serve a mix of local and western dishes. Prices are pretty high compared to other areas in Malaysia, but it is worth it as you are enjoying the perfect tropical atmosphere at Redang. Nightlife usually revolves around the resort bars; alcohol is available almost everywhere on the island. Redang is a perfect area to dive. It is known for its amazing visibility and pristine coral reefs. During a dive you are able to see schools of jacks, fusiliers and trevallies, black tip reef sharks, humphead parrotfish, cuttlefish and turtles. There are even occasional sightings of manta rays and whale sharks. Almost each resort has its own diving school; popular dive schools are Coral Redang Divers, Redang Bay Divers and Redang Pelangi Dive Centre. The costs for a dive vary per resort (usually no more than RM100 per dive). Most resort websites will show prices with or without diving trips. Around Redang there are a number of amazing diving spots, you can sign up for this at your hotel or resort. At most resorts you can follow a diving course; eventually this will get you your Open Water license or 'PADI'. When you stay during the start (or end) of the monsoon period, it might occur that the weather conditions won't allow you to dive. Be aware of this. Snorkeling is also very fun around Redang Island. In this case it means that you can get the equipment and necessities on loan or rent at your resort. At some resorts you can directly snorkel from the beach (private reef or house reef), normally you will be taken to a place to snorkel by boat. At the Marine Park Centre you can snorkel around a wreck, you will also see some bigger fish here and sometimes even a turtle. If you do not dive and only would like to snorkel then perhaps it is better to visit the neighboring island of Perhentian as the snorkeling conditions are far better there (though Perhentian has less luxurious resorts). Best spot for snorkeling at Redang is along Pasir Panjang; especially nearby the Redang Reef Resort. The island is also perfect for nice nature walks. At the resorts you can ask for a map on which all roads are indicated. For these walks the same rules apply as the ones in the jungle (with the exception of the necessity to protect yourself against malaria, which you don’t need in this environment); make sure you have an effective repellant against mosquitoes, and go well-dressed into the bush. In Malaysia you can buy the product OFF, which is quite a good mosquito repellant (it uses DEET as main ingredient). Animals you might spot during your hike are monkeys, monitor lizards, fruit bats and squirrels. The best time to visit Redang is between April and October. However, in October it might already be too late. The northeast monsoon blows from November to March; resorts (with the exception of The Taaras Beach & Spa Resort) are closed during this period. Because of this monsoon the underwater world is a lot less beautiful as visibility is bad and there are currents. Avoid the island during school holidays and public holidays. If you visit Redang between April and October you will still have a chance that it rains; you are still in the tropics. 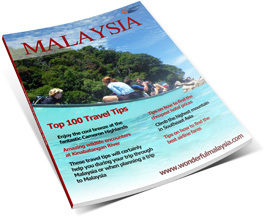 Some Malaysian tour operators offer great deals on Redang. Ping Anchorage for instance has frequent sharp prices to the islands at the eastern side of the peninsula. Next to the sharp prices Ping Anchorage offers destinations you don't just find elsewhere. Of course you can also easily arrange a trip yourself. Just book your flight tickets and reserve a cabana at one of the resorts on the island. This can be done directly via the website of the resort or via popular hotel websites like Agoda.com or Booking.com . If you are planning to do a diving course (Open Water) then you are best off by making the complete reservation (full board diving package) directly at the resort as they will offer the best combined prices. In that case the return boat tickets from Merang Jetty usually are included in the total price. Redang is not an island where you can travel to without any reservations; though you can always try and hope that something is available. There are no roads on the island except for the main road leading from the small airport. Though there are a couple of trails throughout the island, those usually are not used for regular transport to other places on the island. Best way to move around is by boat, contrary to the neighboring island of Perhentian there are no readily available water taxis at Redang Island. Here you just go to the resort lobby to arrange transport. Check your credit card company up front whether they offer guarantees in case something goes wrong. Always ask if payment via PayPal is an option (as then there will be a third trusted party involved). Book a full board package if you are on a diving trip (or doing a PADI course) as resorts offer better prices if you go for the complete package. Do check up front if the resort has a reef in front of the resort; it is just so much more fun if you can go snorkeling right in front of your cabana. When traveling from Merang Jetty to Redang, boat operators almost always charge the same price (RM80 return trip) so there is no point in waiting with the reservations. Make sure you arrive at Merang Jetty well before 4pm (last boat to Redang departs around 5pm). Try to avoid the last vessel as it is always the busiest. Last boat from Redang to the mainland departs at 1pm daily. Backpackers or low budget travelers should head over to Perhentian Island as there is far more basic accommodation available. If you want to get your diving license make sure you make the necessary arrangements beforehand as the diving school needs to have a dive master available. The sooner you make reservations the better the chance the dive school can actually appoint a dive master from the same country (same language). If you are going to do some diving or snorkeling; you will need diving goggles. If you are wearing glasses it would be great to have powered lenses in your mask, but unfortunately almost none of the diving schools at Redang have those. Luckily you can buy them beforehand at the Midvalley Megamall dive shop in Kuala Lumpur for only RM179. They are ready made, so you only need to find out the needed correction (just drop by a store where they sell glasses and have it measured for free). There is no ATM available on the island so make sure you bring along enough cash and a credit card. Cell phone coverage (3G) should be ok at Redang. If you bring along a local sim it should work. The island of Redang is relatively easy to access. From Kuala Lumpur you take the plane to Kuala Terengganu. The cheapest way to get there is by flying with the low cost carrier AirAsia. Other options are Malaysia Airlines or FireFly. Tickets are often available for approximately 25 euro's per person if you buy them beforehand. It is even cheaper during special offers. From Kuala Terengganu airport you take the taxi to Tanjung Merang, a small fisherman’s village which lies north of Kuala Terengganu. The boat ride to the island of Redang departs from Merang jetty and takes about 40 minutes to reach the island. Boat operators between Merang and Redang work with fixed prices for a boat ticket (RM80 for an open return ticket). During peak season there are also boats that depart from Shahbandar jetty in Kuala Terengganu city center. The quickest way to get to Redang Island is by direct flight with Berjaya Air. This airline flies directly from the small Sultan Abdul Airport (Subang Airport) in Kuala Lumpur to the air strip at Redang Island. People arriving (or residing) in Singapore can also fly directly to Redang with Berjaya Air from Changi Airport. Though this is definitely the best way to get to the island, it is also by far the most expensive way as a return ticket will cost over RM800 per person.